Tribune Publishing Company has reported its Q4 and full-year results for 2018, revealing positive numbers across digital content and subscriptions with a boost to its net income. The company reports its net income increased to $2.4 million in Q4 of 2018, compared to a loss of $0.4 million in Q4 of 2017. 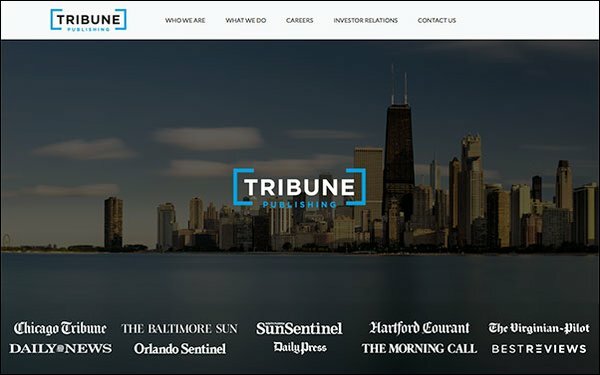 Tribune’s adjusted ABITDA increased to $46.5 million in 2018, up $11.3 million year-over-year. Those positive numbers continue across the company’s digital sphere. Digital content revenues increase by 145% compared to Q4 of 2017. Digital-only subscribers increased by 47% to 250,000 at the end of Q4 2018. The company counted 170,000 digital-only subscribers at the end of Q4 2017. Tribune Publishing operates under two divisions: The company’s media groups excluding digital revenues and related expenses, except for digital subscription revenue combined with print subscriptions. Another includes all digital revenues and related expenses that encompass the company’s websites, third-party websites, mobile applications, digital-only subscriptions, Tribune Content Agency and BestReviews. In Q4 2018, Tribune’s media group saw revenues of $227.2 million, a decrease of 8.3% compared to Q4 2017. Advertising revenue was down 12%, which marked an improvement compared to Q3 of 2018. The group recorded increased expenses of 1.8%, compared to Q4 2017. Its Q4 2018 income was $0.5 million with an adjusted EBITDA of $33.2 million. The company’s digital group recorded total revenues of $49.4 million in Q4 2018, up 1.2%, which the company says was driven by its BestReviews and Virginian-Pilot Media Companies (VMPC)acquisitions and growth across its digital-only subscription revenue. The digital group saw Q4 2018 advertising revenues decrease by 33.3% year-over-year because of changes in its Cars.com arrangement, an extra week in 2017, and lower page views that came from social media and search algorithm changes. Content revenues, however, which include digital-only subscriptions, content syndication and commerce revenues, increased by 144.8% year-over-year. The company reports digital content revenues increased organically by 23.7% when the effects of the VPMC and BestReviews acquisitions are excluded. The group’s adjusted EBITDA was $14.3 million, up by $10.3 million compared to Q4 2018.